This beautiful ring has an exotic 2.55 carat oval cut Bicolor Sapphire center, flanked by two baguette diamonds and encircled by a halo of round diamonds. Additional diamonds trace down the side shank, bringing the total diamond weight to 1.16 carats. "This stone exhibits a change of color when viewed under daylight or fluorescent vs incandescent light." (see photo #2) Ring size 6.5, with room to size up or down. This ring can be professionally sized to your specifications at no charge, following your purchase. Many of our items have matching companion pieces. Please inquire. 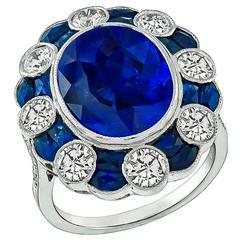 GIA certification has been obtained for the sapphire center in this ring. GIA certification is a true mark of global distinction and a credential symbol of knowledge and trust throughout the jewelry industry.